the 13 episodes of this series have totally inflated by number of books read this year. Now that they are all released, I'm going to reread and see what I think of the series as a whole. I kind of wish I'd waited until it was all done before reading. I'm also on the fence about the fact that it ended on a cliffhanger. Hmph. 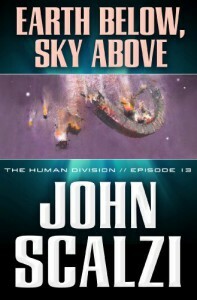 At least there wasn't an annoying love triangle.I do enjoy Scalzi's humor quite a bit, but many of his characters sound...exactly like each other, which sound like HIM. I do enjoy visiting the future as he envisions it, and I will definitely read more to see where he takes things in the next "season" of this story.